New poll suggests that 45 per cent of Canadian homeowners plan to renovate this year. If you're thinking about renovating your home this year, hopefully you've locked in your contractor as they'll likely be busy in the coming months. According to CIBC's annual home renovation poll, 45 per cent of Canadian homeowners say they expect to undertake some sort of home renovation this season, compared to 48 per cent last year. Compared to 2017, Canadians plan to trim their spending on this year's home renovation plans. This year, Canadians said they plan to spend an average of $10,959 which is lower than last year's budget of $11,795. And for the most part, the work will be paid for in cash as 59 per cent said they will use cash or savings to fund their projects, while 29 per cent will cover the costs with a loan, line of credit or credit card. "Canadians continue to see the value of investing in their homes, but they're taking a very practical approach by focusing on lower-cost projects this year," says Edward Penner, Executive Vice-President, CIBC Personal and Small Business Banking. "No matter how big or small the project, your first step is to figure out what's needed, what you can afford and how you're going to pay for it so you can enjoy your space without the worry of overspending and unnecessary debt." 52 per cent say they'll undertake basic maintenance including painting, flooring, etc. No matter what the renovation however, CIBC suggests that you plan and budget for the unexpected. "Whatever the size of your project, don't plan down to your last dollar. Be sure to allow for overages or unexpected expenses," says Mr. Penner. "If you choose to use a credit card to make purchases for your renovation to earn rewards, be sure to have a plan in place to pay off the balance, so your project doesn't end up costing you more than you plan for." 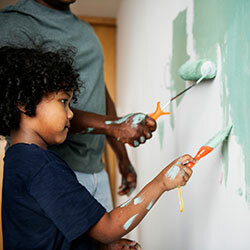 A new paint job, roof, or landscaping likely won't affect what you pay for home insurance, but there are some projects that will. Putting in a swimming pool, for example, may require that you increase your liability coverage. A swanky new bathroom, basement or kitchen, on the other hand, can increase your home's value which may require you to increase your policy's replacement cost. In either case, before undertaking any major renovation, give your home insurance provider a ring to ensure you're adequately covered both during the renovation as well as after. Is your home insurance in need of a redo? While staying up on maintenance and repairs is always a good idea, your home insurance likely could use some work too. Compare home insurance quotes today at Kanetix.ca to protect your biggest investment in minutes.